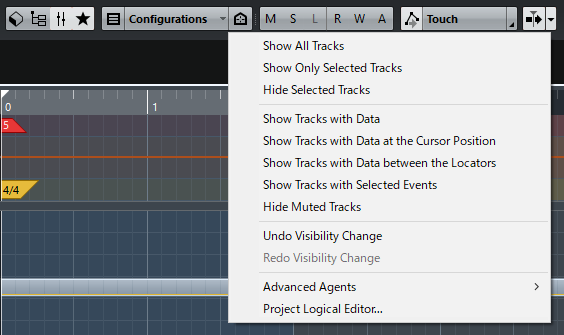 If "Disabled Tracks" was added to the list for Filter Track Types then you could hide all disabled tracks you don't use. It can also be added to the Logical Editor ("If track is disabled..."). Example: "Disable Tracks Without Data"
You have a template with disabled tracks, you enable the ones you want to use and then hide the rest. Last edited by djw on Tue Jul 25, 2017 4:55 am, edited 6 times in total. Could I get a confirmation on whether this request has been noticed? +1 integrate disabled tracks also into PLE ..
PLE has a filter target property for disabled tracks, and using it you can perform whatever action is available in the lower pane of the PLE, or, using Function: Select you can invoke any command for it. Also, a disabled track is not a type of track, so it doesn't belong in the Track Types list. At least that's my problem. All of what you describe already exists in the PLE, unless I have not understood. Yesterday I did every PLE "script" act like I wanted to, the problem is the time invested in this because it should be much easier as the OP said, it should be already in the menu, I added some features like never ever show if the track name contains a "$" or always show if it contains a "%" if anyone is interested on this pm me. Maybe we're not understanding each other, I suppose due to a language barrier. All the track types are available in the filter section of the PLE, and the Disabled track property is also available as a filter. This feature request is to have "Disabled Track" added as a Track Type so it can be filtered using the PLE. "Disabled" is a track property, not a track type, so it must not be added to that menu. But it is not even necessary, since the PLE already has a filter for Disabled Tracks, and, all the track types also have filters available in the PLE. The time you took to customize your workflow compared to the total amount of time you will spend in Cubase is quite trivial, and allows you to have something you want, which might be useful to 200 other user, perhaps, out of 200,000. Cubase provides the ability to do this for that reason, a wide variety of workflows can be accommodated, much more than if the devs tried to implement each individual feature that is requested. This was all solved in 9.5 wasn't it? Yes, but I suppose folks haven't gotten up to speed, perhaps? I've been using cubase for more than 10 years and the problem is when in a template you have 50 group tracks already routed but you use just say 20, if I use the visibility agents and show group tracks I'll end up seen all 50 tracks... Of course I could use also the hide muted tracks filter but that limits the mute function. 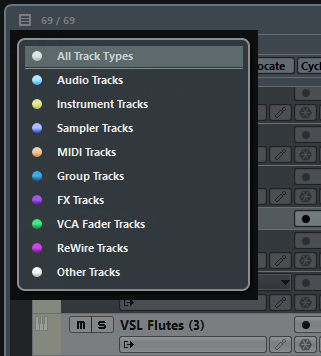 The time I spent making this customization bothered me because it's a feature already in pro tools, just like all the "new" features for cubase but old for other daws, i would choose cubase over any daw but visibility agents, macros and PLE are far from practical, another problem is that visibility agents are specific for each project, with my customization you can make visibility changes for any project. Even simple things with filter track types: Why isn't Input and Output separate selections? Why are input/output tracks considered "other"? Often I want to just select Input OR Output alone. It really could be improved.